At 11.05 this morning, the helicopter carrying the Holy Father Francis, which had departed from Alessano, landed in the square of Cala Sant’Andrea, next to the Cathedral of Molfetta. Upon arrival the Pope was received by the bishop of Molfetta-Ruvo-Giovinazzo-Terlizzi, H.E. Msgr. Domenico Cornacchia, and the mayor Tommaso Minervini. The Pope transferred by car to the port of Molfetta, where he greeted the faithful at the docks, arriving at the stage set up for the Eucharistic celebration. 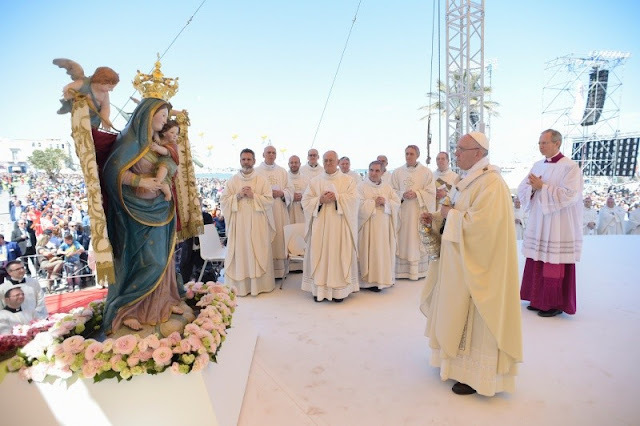 At 11.20, in the port of Molfetta, the Holy Father presided at Holy Mass. At the end, after the greetings from H.E. Msgr. Domenico Cornacchia, the Pope greeted a representation of faithful. At 13.40, the Holy Father departed by helicopter from the port of Molfetta, for his return journey to Rome. The Bread of life, the broken Bread is indeed also Bread of peace. Don Tonino claimed that “peace does not come when one takes only his bread and goes to eat it on his own. [...] Peace is something more: it is conviviality”. It is “eating bread together with others, without separating, sitting at the table among different people”, where “the other is a face to discover, to contemplate, to caress” . Because conflicts and all wars “find their roots in the fading of faces” . And we, who share this Bread of unity and peace, are called to love every face, to mend every tear; to be, always and everywhere, builders of peace.